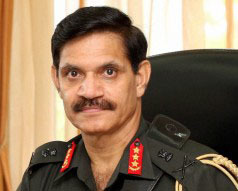 Army Chief General Dalbir Singh has said Pakistan is supporting a proxy war in Jammu and Kashmir despite suffering casualties due to terror on its soil. General Singh said, terrorists are finding it difficult to infiltrate from Line of Control and therefore their focus has shifted to international border. He said, the Army is keeping strict vigil and will retaliate appropriately to every ceasefire violation.On China, the Army Chief said, India is following a policy of constructive engagement with that country and India-China border is peaceful. He attributed it to confidence-building measures, CBMs with China. On issues related to Line of Actual Control with China, General Singh clearly mentioned that transgressions will not occur once the matter of demarcation at LAC was addressed. General Singh said, the infrastructure development especially along the Northern and North Eastern borders remains a large priority to meet the capability gap. Admitting that the Army is facing many challenges and needs modernization, he said, concerted efforts are being made to fill the gaps in the requirement of arms and ammunition. He said, the focus is also being given to modernisation of tanks and comprehensive overhaul of infantry combat vehicles.